Inaugural Eating Starts on the Road to D.C.
With the Obamas’ much-discussed habit of healthy eating, this week foodies from all over the nation will travel to D.C. to munch up sustainable goodies at two green inaugural balls and revel in the election of our svelte, tech-savvy, 44th president. 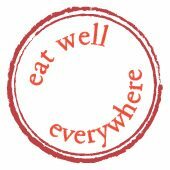 As the hungry hordes converge on Washington, Eat Well Guide has them covered. Traveling from New York(pdf) or Chicago(pdf)? Print out ready-to-go driving directions highlighted with sustainable food vendors all along your route. Driving to the nation’s capitol from some other town? Two minutes with Eat Well Everywhere will give you a custom trip book with the best co-ops, restaurants, and B&Bs along the way that serve up local, sustainably produced food. Eat Well develops free high-tech tools for the local food movement. Visitors to our site can find good food, create customized guides with our innovative mapping tool, enjoy the “good food feed” of The Green Fork blog, and learn how to create a better food system with our online activist resource, Cultivating the Web.